One of our local Vancouver news sites posted this story yesterday: Students in Chilliwack Getting Free Bibles in School. 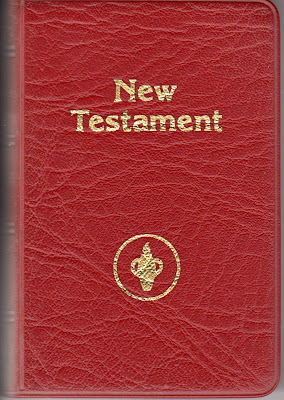 I received one of those New Testaments from the Gideons when I was in the fifth grade, as did every other Canadian child until some parents started voicing concerns about Christian indoctrination and such. This kind of protest increased to the point where there are very few schools that permit the distribution of the little Bibles these days. Apparently, it’s now considered discrimination against other religious groups and interferes with parents’ rights to educate their children. If a parent truly believes it is their right to educate their children, then home school the kids and be done with the evil Christian influence they think occurs in public schools. But many parents can’t, or don’t want to. Instead, they become so vocal about their “rights” that teachers aren’t allowed to do much more than read out of a text book because if they state anything that sounds like an opinion, they are raked over the coals by one group or another. The result is kids who grow up to mimic their parents’ attitudes and receive a narrow-minded education in the process. They are intolerant of anyone who does not agree with them. That’s my opinion, based on what I see and hear around me. Let the Gideons hand out their Bibles. If you don’t want your child to have one, then don’t sign the permission slip. But to start hurling unfounded and ridiculous accusations is a little bit over the top, don’t you think? We’re facing the end times, folks, and this news article talks about just one tiny little event in the grand scheme of things. But the gray area between black and white is thinning quite rapidly. We can’t camp there anymore. Christians, take a stand. The enemy knows his days are numbered and he’s pulling out all the stops while he still can. I’m so glad I know Who wins. This was the headline I read first thing this morning. And I got mad. You know – the kind of mad that rates the “righteous anger” category. This isn’t intended to be a political blog post as much as it is a rant about the way media spins a story. In this particular news article, 26% of 1500 people surveyed stated that they thought Stephen Harper was the worst Prime Minister Canada has had in 40 years. So 390 individuals don’t like Mr. Harper. Hardly a good indication of how the other 35,000,000 citizens of this country feel. The folks down at media headquarters decided it was time to start a fire, so they came up with a headline that isn’t exactly a lie, but it ain’t the whole truth either. And people being people, most won’t even read the article. You think the media doesn’t know this? All I wanted to say was that I believe this “news” article gave a false view of Mr. Harper’s administration. A Prime Minister’s job is difficult enough without having to deal with junk like this showing up in the media. We want the truth in the news. Not Prime Minister bashing. And for the record, thank you Mr. Harper, for a job well done. Here’s the thing about long weekends . . .
Today was BC Day. For all of my non-Canadian readers, B.C. stands for British Columbia, which is the province (not providence) on the west coast of Canada. Anyway, BC Day always comes along on the first Monday in August, which means we just had a long weekend. But here’s the thing about long weekends: they end. Too soon. Every time. I had big plans for this particular long weekend. I was going to work on The Bond of Seven and get at least three chapters done so Emily (my granddaughter) would stop asking me what happens next. Didn’t happen. I was going to write several blog posts. That didn’t happen either. And I was going to clean the house. We won’t talk about that. The bottom line is that I pretty much didn’t do anything I had planned to do. I spent a lot of time with my family. I read a whole book. I cleaned my bathroom. I went to church (awesome sermon). I read my Bible. I got some new friends on Facebook. I got a fair bit of work done at the coffee shop. I watched women’s Olympic soccer (sad loss for the Canadians) and I don’t even know anything about soccer. So I didn’t do what I thought I would do, but I did other important things on this long weekend that ended way too quickly. And then something our pastor said last Sunday came to mind. God’s agenda supersedes all the agendas of man. We need to function on the playing field He sets out for us. I’m not saying it was necessarily God’s agenda that I do all the things I did or didn’t, but it reminded me that I need to be listening to what He is telling me. I need to hear His voice when He lays out His agenda for me. And then I need to obey, even when He is asking me to do something that may not fit into my plans. We’re going on a road trip. Leaving before the crack of dawn, even. We will make the eastern trek over the great Canadian Rocky Mountains and across a considerable expanse of prairie to reach our destination. Eighteen hours in the car. Maybe nineteen if we stop for too many potty breaks. Can you appreciate what this kind of driving time does to your brain cells? You’re pretty good for the first six or eight hours, but after that it’s snoring with your mouth open (hopefully not the driver, of course), laughing at practically anything, and stiffness in the posterior regions. You’ve sung through the top fifty on the oldies station providing, of course, you’re already through the mountains and have a radio signal again. You’ve discussed your life goals in detail. And you’re wondering if that really was a Sasquatch you saw over there in the trees. Good times. Then the boredom sets in. There is silence in the car, each of us alone with our thoughts. We check the clock every fourteen minutes. We calculate, for the twelfth time, how long it will be until the agony ends. We stop caring about roaming charges and start texting, emailing and Facebooking anyone who will answer. Could there be any better way to travel? I’ve never purposed this blog to be political in any way, but there are times when the subject bears review. We Canadians voted yesterday – our fourth federal election in seven years. And the people of Canada chose Stephen Harper, once again, to be our Prime Minister. But this time he has a majority government, giving him the opportunity to do the job he was elected to do. Personally, I’m looking forward to a surging ahead of our great country, with Mr. Harper at the helm. Is he perfect? No. But the man has morals and values and a strong Christian faith that so many have let fall by the wayside, especially our leaders.